Smart products are everywhere. They track your packages, control traffic lights, fly aircraft, and guide you to your destination. They’re at the heart of the systems and services you use every day. Intelligent, instrumented, and interconnected products are revolutionizing the way we interact with each other and perform everyday tasks. Through a combination of electronics, software, sensors, and other hardware, we have the technology to create multifunctional customized products. The real challenge in creating smart products is one of organization: how can we effectively and efficiently integrate a complex combination of technologies to create an intelligent “system of systems” that fulfills its promises and lives up to its potential? The solution lies with systems engineering. 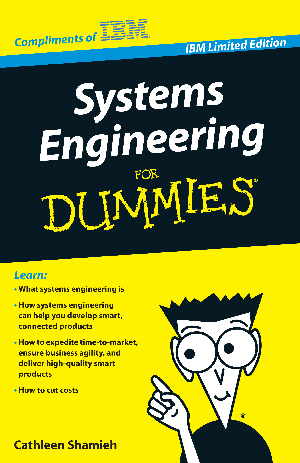 Systems Engineering For Dummies, IBM Limited Edition, explains what systems engineering is and how it can help you harness the complexity inherent in developing smart, connected products. If you’re looking for ways to expedite time to- market, ensure business agility, and deliver high-quality smart products while cutting costs, Systems Engineering For Dummies, IBM Limited Edition, is the book for you.